Based on the fundamentals of electromagnetics, this clear and concise text explains basic and applied principles of transformer and inductor design for power electronic applications. It details both the theory and practice of inductors and transformers employed to filter currents, store electromagnetic energy, provide physical isolation between circuits, and perform stepping up and down of DC and AC voltages. The authors present a broad range of applications from modern power conversion systems. They provide rigorous design guidelines based on a robust methodology for inductor and transformer design. They offer real design examples, informed by proven and working field examples. worked examples in MATLAB, end-of-chapter problems, and an accompanying website containing solutions, a full set of instructors’ presentations, and copies of all the figures. 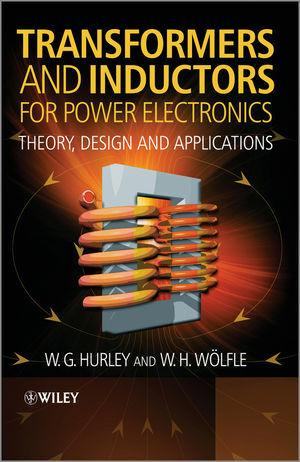 Covering the basics of the magnetic components of power electronic converters, this book is a comprehensive reference for students and professional engineers dealing with specialised inductor and transformer design. It is especially useful for senior undergraduate and graduate students in electrical engineering and electrical energy systems, and engineers working with power supplies and energy conversion systems who want to update their knowledge on a field that has progressed considerably in recent years. Professor Hurley is the Founder/Director of the Power Electronics Research Centre at NUI, Galway. He has over 35 years of experience in the field of Power Electronics, specifically dealing with Magnetics, and is a Fellow of the Institution of Engineers of Ireland. He is currently an Associate Editor of the Journal of Advances in Power Electronics. He has published more than 100 papers in peer reviewed journals and conference proceedings with over 700 citations. Dr. Wölfe is currently a Managing Director of Convertec Ltd., a company that develops high-reliability power converters for industrial applications. He has been involved with designing magnetic components for power electronics for over 30 years and is also an Adjunct Professor of Electrical Engineering at the National University of Ireland, Galway.